When it comes to business promotion on Instagram, some excellent tools are of the biggest requirement for marketers and influencers. These tools can be of great assistance since they help in improving and boosting your business efficiency. Taking this into consideration, this article will focus on some powerful Instagram tools that can be used to increase your followers and manage post as well. Let us get introduced with those tools. The first Instagram tool that can do you favor is VSCO CAM. With the help of this tool, one who is a newbie can be relaxed since it is really easy to use. VSCO offers a bundle of photo editing options. We know that Instagram is all about posting great photos and this tool will let you fulfill this purpose. It has got various filters and enables you to adjust exposure, contrast, sharpness, saturation etc. Using this Instagram tool is going to be fun. Snapseed is the next in the list when you want to beautify your photos. Being able to work with any object on the photo and make alterations with brightness, contrast or saturation levels is its greatest strength. You can adjust and get your photos enhanced ultimately making them look real and not artificial. This Instagram tool can be used on iOS devices easily. Now, not just photos only, when posting on Instagram, videos play a major role. And we should admit that videos can tell more than the pictures and gain popularity much faster than photos. When it comes to edit videos, Filmora can’t be ignored. It can be considered as the best Instagram tool for editing videos. 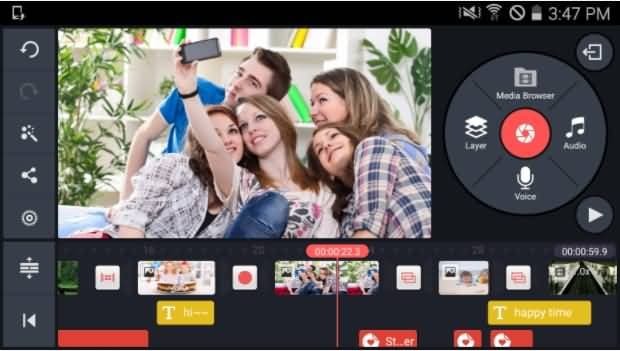 Its modern and easy interface has made editing of videos easier than ever. It gives you lots of tools including basic ones as well as advanced tools. For instance, you get 4k editing support, reverse option to make videos play backwards, color tuning, noise removal, audio separation and many others. It can be your one-stop solution when you’re looking for an outstanding Instagram tool to edit your videos. Also, you can simply use it on Windows and Mac. A yet another Instagram tool for editing videos is KineMaster. You can find it on Google Play since it give privilege to merely Android users. Several video effects, transitions and editing options are provided to users. It offers trial version to users while you will have to pay $4.99 subscription each month so that you can utilize different functionalities associated with the app forever. Here is another Instagram tool for Android users – Quik. With the help of this tool, one can add up to 75 video clips and photos which are then analyzed by Quik and cut to make short clip. You can also add your own highlight moments if you want. Moreover, you can download it for free and there are no in-app purchases. The next Instagram tool included in the list is iMovie which many of you are certainly aware of. It is an Apple’s own app for video editing. With the recent updates in the app, it has become more powerful and affective giving the 4k support to the users. When you work with iMovie, you can edit videos easily with its intuitive interface. It will enable you to add titles, voiceovers, music and even photos. It also offers 10 video filters, 14 Hollywood-style trailers templates and much more. In this digital era, where people find any possible way to expand their market reach and gain followers, Instagram is at peak. And you must have into other social platforms too; it might be difficult for you manage all the platforms at once. It’s obvious that you dedicate your time for other stuff like handling client, dealing with employees and more. There comes Instagram tools for scheduling posts in handy. Here are two most commonly used tools which can help for scheduling your Insta posts. Sprout social is designed especially for Instagram management. It can schedule posts, manage your comments, get your hashtags in observations and many more. You can manage and maintain your daily Instagram post by scheduling them. It has also made the process of Instagram publishing much easier. The next tool for Instagram post management is Hootsuite. With this tool, you can simply schedule your content, write captions for the post, set dates when the post is to be published. Your feed will be directly posted to your Instagram at the time you have scheduled. It also provides the functionality of managing all your social media accounts at one place. Not just posting, you would also want to examine your data. So, this curiosity of analyzing the Instagram algorithm can be fulfilled by one of the popular Instagram tools namely Instagram Insights. As the name itself simply clarifying, this tool will enable you to get insights of the Instagram. This will make you aware with the information about your followers or when they’re available on Instagram, how much traffic your stories are gaining, who has visited your profile by clicking on your username etc. Thus, when you want a revelation of your Instagram account, you can make use of this tool. The next Instagram tool for scrutinizing your Insta account is Simply Measured. It is another tool that works pretty fine when it comes to Instagram analytics. With the help of Simply Measured, you get the chance to get understanding on story analytics like the number stories saved, replied, tapped forward and much more. Technology has gone too far and has made it easier to expand business reach to the audience unlike the older days. Instagram has created a special place for business owners to expand and promote their business as well as increase followers. With the help of above mentioned Instagram tools, you can give your posts enhancements, manage them well and also can get an understanding on the insights of your Instagram account. Please let us know if this post turned out to be helpful for you. Thanks for reading!